A PC stick, also known as a compute stick, is a pocket-sized device designed to plug directly into your TV’s HDMI source input. A PC stick transforms your TV into a personal computer capable of running general purpose software. They support a wide variety of consumer applications, ranging from Web TV, office automation, home theater and gaming; even commercial applications like digital signage. Due to their market success and popularity PC and compute stick products are now entering their second generation, offering a better overall user experience. We aim to present product features consumers should look at before choosing a particular PC stick brand. The stick’s internal 32GB storage is sufficient for most applications. However, applications like home theater may require additional storage capacity for media files. To expand hard drive storage you can attach an external USB hard drive to the PC stick’s USB port. Note: If you chose this option it’s better to select a product with a higher speed USB 3 port. Another solution is to use a high capacity SD card. SD cards are commonly used to expand storage on your mobile phone. For this expansion option, you’ll need a PC stick with a built in SD card slot. With a SD card there is no external drive or the need for an outlet to power the USB drive. While typical user applications are not compute (CPU) intensive an under-powered PC stick can certainly impact the user experience: programs take longer to run, the system performs sluggishly. First generation sticks used the Intel® “Bay Trail” CPU chipset which ran at a modest 1.3 GHz. When pushed, performance sometimes suffered under heavy load. 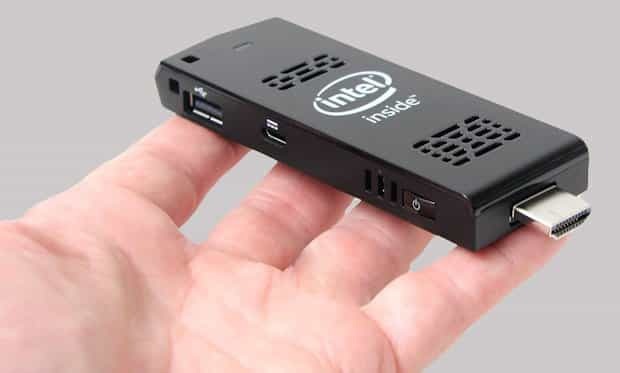 Second generation PC stick products have upgraded to the next generation Intel “Intel Cherry Trail CPU” chipset which offers a much higher performance CPU architecture running up to 1.84 GHz. Even with a faster CPU a PC stick with 2GB RAM may still underperform if a user runs multiple applications at the same time. To combat this problem some product vendors are now offering products with 4GB RAM. This is something to consider if you do a lot of software multitasking. Due to their small size PC stick circuit board electronic components are very densely packaged. This causes serious heating that requires an effective cooling system. It is important that your PC stick incorporate some type of cooling system; either passive or active. PC stick with passive cooling use the packaging to radiate the heat. PC stick with active cooling use tiny fans and a thermostat system that turns the fans on or off depending of the ambient temperature. Choosing a product with good internal cooling becomes even more important if you plan to use your stick for playing high definition (HD) video. HD video playback, which very compute intensive, can dramatically raise the stick’s core temperature. Another way to connect your PC stick to the Internet is through the use of wired Ethernet. Wired connections have inherently better networking performance and overall stability compared to WiFi. As many home WiFi routers have built in wired Ethernet ports you simply connect a network cable from the router to your stick. Using a wired connection can be important if you’re using a PC stick for watching streaming HD media. WiFi connections often become unstable when supporting high bitrate streaming media. The result is a video presentation that visibly stutters or pixelates when the WiFi system is under heavy load. To add a wired connection you can use the PC stick’s integrated USB port to plug in an external Ethernet adaptor. A PC stick is an ideal device for displaying digital signage. Their low-cost, small size, excellent HD video support and built-in networking make them a natural fit. As it runs Windows, you can use your PC stick to display PowerPoint presentations. PowerPoint is an easy way to create and display multimedia digital signage presentations. The pairing of a PC stick with PowerPoint offers an attractive, low-cost way to implement digital signage for small and mid-sized businesses. However, the big difference between digital signage and other home/consumer applications are its performance demands. Unlike in the home, where it is used intermittently, for digital signage a PC stick will be running continuously, 24×7. Compounding this, the digital sign may be displaying high definition (HD) video in a continuous loop. For this purpose, you need to select a high quality PC stick with a high performance HD graphics controller. We recommend products that incorporate the high performance Intel Gen8 HD graphics controller. As discussed earlier, HD video playback will dramatically raise a stick’s core temperature. Playing HD video continuously will place a significant thermal load on the PC stick. If you choose a PC stick with fan-based cooling, dust accumulation can seriously impact the fan’s performance, degrading its cooling effectiveness. This can lead to intermittent failures or permanent damage of your PC stick. For these reasons, it is important to select a PC stick device with fanless passive cooling if your digital signs will be displaying HD video–especially in dusty settings. There are a wide variety of PC stick products from reputable vendors. Aside from the minimum feature requirements that I listed earlier, think hard about the main purpose you have for buying a PC stick. Are you looking for a second PC for your kids? A home theater system for watching movies? Or are you a small business owner looking for a low-cost digital signage solution? Based on your answer certain PC stick product features will become very important. Choose wisely. Our company developed PowerSignage™, an affordable digital signage service designed for small to mid-size companies. With PowerSignage customers use Microsoft® PowerPoint® for digital signage content creation and low-cost PC sticks for digital signage display. For more information please visit our website at https://www.powerdigitalsignage.com. Microsoft and PowerPoint are registered trademarks of Microsoft Corporation. Intel is the registered trademark of the Intel Corporation. PowerSignage is the trademark of Power Media Design Pty Ltd.
CopyrightⒸ 2017 by Power Media Design Pty Ltd., all rights reserved.